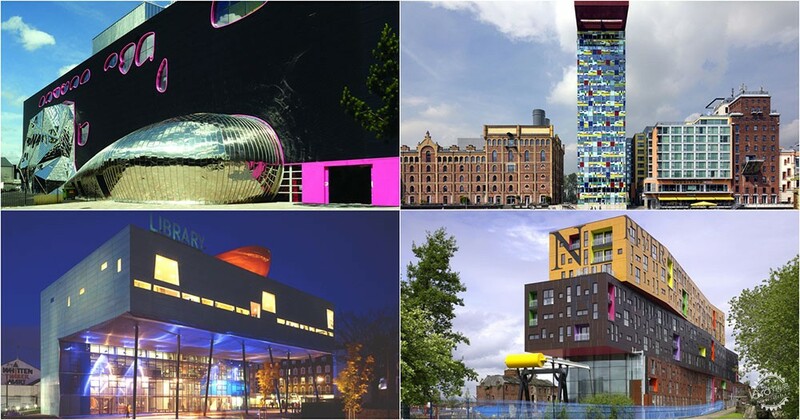 The late British architect Will Alsop was noted for his exuberant and irreverent attitude that took material form in his expressive, painterly portfolio of educational, civic, and residential works. At the ripe age of 23, he was awarded second place in the 1971 Centre Georges Pompidou. From there, he went on to work for the ever humorous Cedric Price before establishing his practice with John Lyall, and eventually many others, in the early 1980s. With a career spanning almost fifty years, here are ten iconic works from an architect who never missed an opportunity to play. Completed in 2004 and housing the Ontario College of Art and Design University’s Faculty of Design, the floating volume towers over the university’s historic structure—seemingly dancing on multicolor crayon-like stilts. The graphic black and white cladding of the addition has not only impacted the skyline of Toronto but directly influenced the branding of the school, which currently is based on Alsop’s checkered motif. Wrapped in what appears to be red, green, blue, and black mesh lozenges, the Fawood Children’s Centre provides facilities for autistic and special needs children, as well as adult learning services. 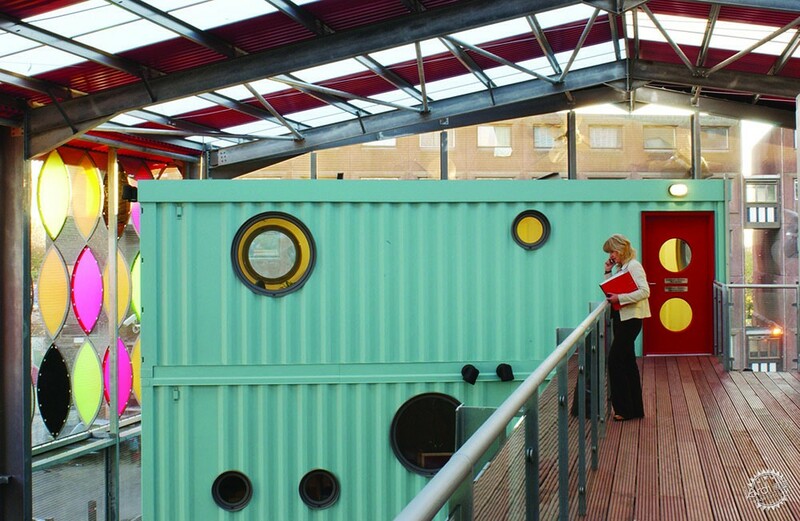 Inside, powder blue recycled shipping containers are stacked together to provide space for the nursery while large portholes offer vistas into the classrooms and communal spaces below. Blending Alsop’s noted dry sense of humor with his trademark whimsy, it comes as no surprise that Peckham Library, located in south-east London, takes the shape of an enlarged teal letter "L." The children’s library and adult learning facility are defined by the cantilevered reading room which generated a new public space and tripled the institution’s membership. Peckham Library was awarded RIBA’s prestigious Stirling Prize for Architecture in 2000. Described as quirky, bold and robust, Chips is a residential apartment complex located along the Ashton Canal in New Islington, Manchester, England. The eight-story structure drew its concept and name from the formal properties of three flat chips stacked atop one another. The mixed-use complex was commissioned in 2002 and officially opened in the spring of 2009. What happens when your cross Archigram and Andy Warhol? 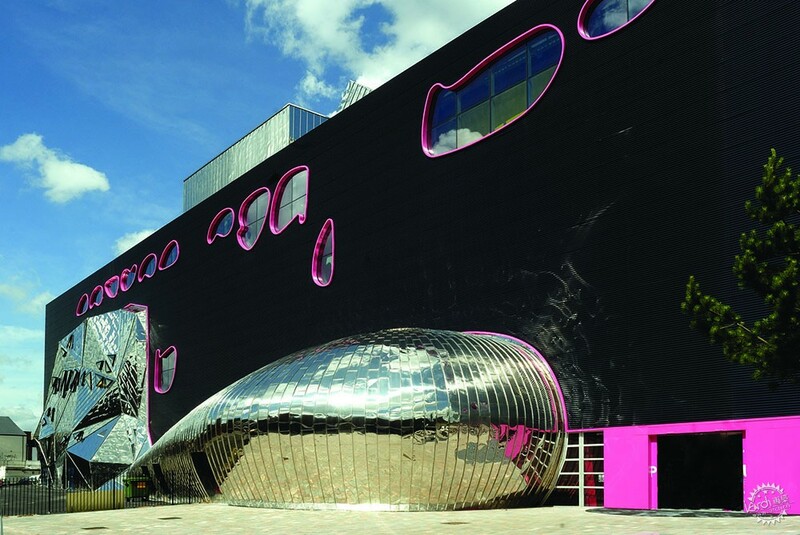 The result is Alsop’s multifunctional art and community center The Public located in West Bromwich. The long black rectilinear volume is described as a “house of delights” containing a landscape with suspended organic forms, curving walkways, psychedelic colors, and openings that appear more like bodily orifices than windows. In 2014 the structure was converted into a college. Alsop was commissioned to design two new stations as part of Toronto’s subway expansion. 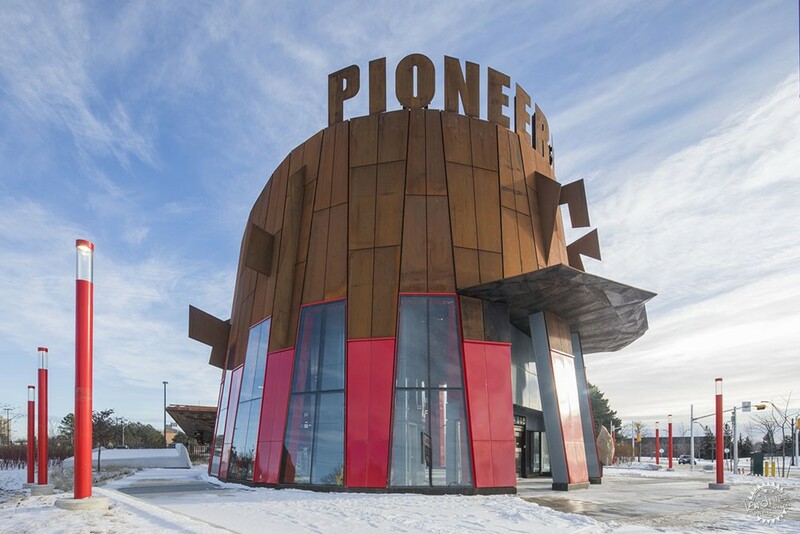 His weathering steel sculptural structures for the Pioneer Village location consist of an undulating, almost creature-like station alongside a grand faceted canopy that houses the regional bus terminal. 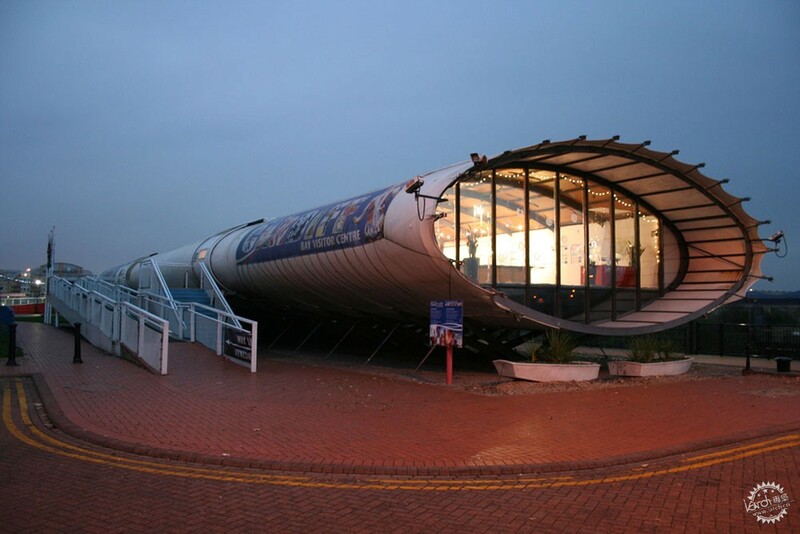 Working with then partners John Lyall and Jan Störmer, Alsop produced this cigarette lighter-inspired structure as a temporary visitor’s center for the Cardiff Bay Development Corporation in 1990. The resulting flattened tube was constructed of steel ribs clad in marine plywood and then covered with PVC sheeting with slots to allow for dappled light within the interior and exhibition spaces. 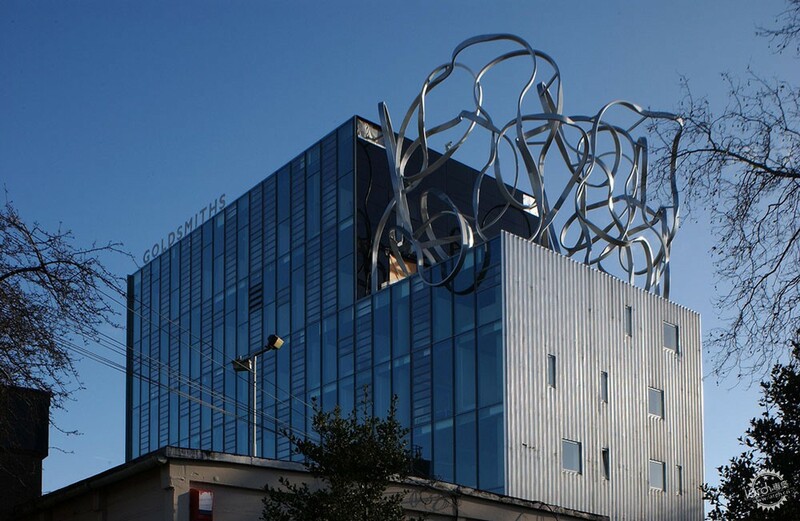 Opened in January 2005, this seven-story addition to Goldsmiths, University of London houses both the institution’s digital studios and the unique research department for the Centre for Cognition, Culture and Computation. The architect clad three sides of the extruded volume in corrugated metal while leaving the entire north elevation entirely glazed to provide natural light with the various studios and laboratories. In true Alsop fashion, a nine-meter-high steel “scribble” wraps the outdoor terrace as a playful reminder of the messy work happening within. This 62-meter high, 18 story tower located on the Speditionsstrasse peninsula and Dusseldorf boasts a graphic facade of intricate pieces of colored glass that recall anything from international flags to Mondrian paintings. Completed in 2001, Alsop imbued what could have been a pedantic corporate office block with a charm that continues to reflect the ripples of the Rhine across its quilt-like skin. This education and sports facility—complete with a faceted green skin—is simultaneously an urban campus and sporting ground that use Alsop’s unique structure to feed the needs of both programmatic requirements. Lecture halls, theatres, and a new media center compliment the 150-seat auditorium.